Coalition rallies to save the Williams Memorial Residence. 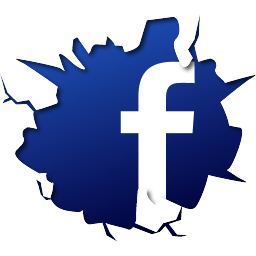 Image Credit: CityLand. Elected officials join senior residents to protest sale and relocation of Upper West senior home to Harlem. 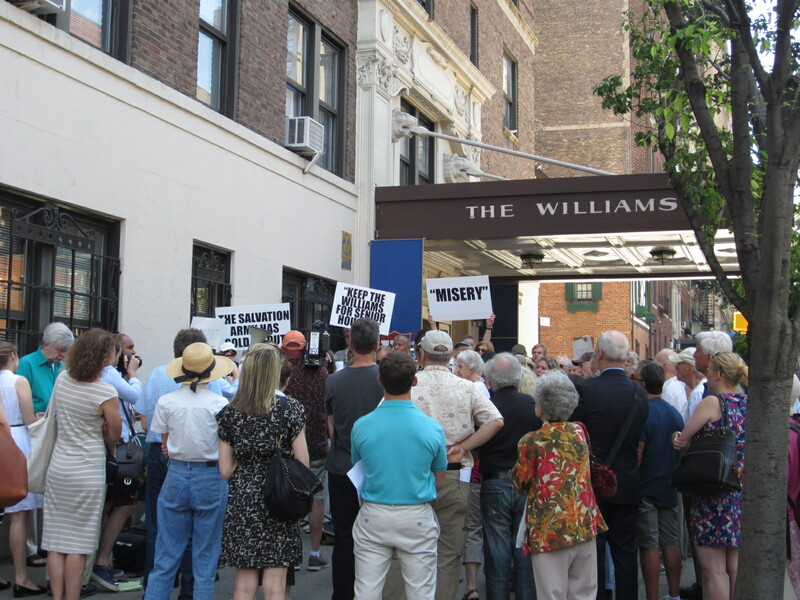 On June 18, 2014, elected officials and senior residents held a rally outside the Williams Memorial Residence, a 15-story independent senior living facility, located at 720 West End Avenue, in Manhattan. The rally, attended by nearly 200 people, was held in protest of the Salvation Army’s plan to sell the property, which it has owned and operated as a senior housing facility for over 45 years. The proceeds from the sale would fund a new facility on 125th Street and Third Avenue, where displaced seniors would be offered housing, including the same services provided for them at the Williams. However, senior residents backed by coalition officials are not prepared to incur the physical or emotional costs entailed in being uprooted from their homes. The rally was prompted by the Salvation Army’s pre-sale filing with the Supreme Court, Rockland County, indicating the organization’s intention to seek approval of the sale from either the court or from the Attorney General’s office, as required by New York law when a not-for-profit corporation wishes to sell or lease any asset. The Salvation Army opened the Residence in 1969 after purchasing it with donations earmarked for the benefit of the elderly. According to a letter sent by City Council Member Helen Rosenthal to Salvation Army officials on June 5, co-signed by all coalition members, elected officials had received repeated assurances that all options for the Residence’s future were on the table. However, as suggested by the pre-sale filing, the Salvation Army appears committed to selling the Residence, contending that it cannot continue to meet its operational costs. “A lot of thought went into this project, and after a lot of analysis, the creation of a new facility allows us to serve the most seniors with the best facility,” explained Major James Betts, General Secretary for The Salvation Army Greater New York Division. The Salvation Army has a deal in place to sell The Williams to Brack Capital Real Estate for $108M. Salvation Army rendering of proposed 125th Street facility. Image Courtesy of BerlinRosen. 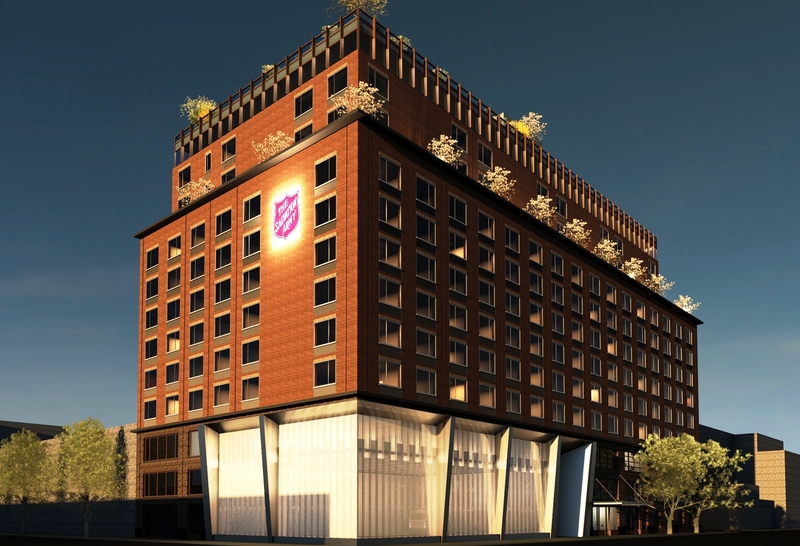 Salvation Army officials have countered that the organization is willing to fund residents’ relocation costs and also to freeze their rent rates for at least 18 months at the proposed 125th street development. Residents, however, note that the cost of living at the Residence is already high given that rents have risen substantially since the building’s opening in 1969. Today, rent for a one-bedroom unit with a kitchenette runs as much as $4,495/month. Residents also contend that the Residence presently houses only 213 residents out of 352 available units because the Salvation Army stopped accepting new resident applications in anticipation of a sale. Plans for the 125th street facility, however, account for just 250 total units. The full coalition includes: City Council Member Helen Rosenthal, U.S. Congressman Jerrold Nadler, NYC Public Advocate Letitia James, Manhattan Borough President Gale Brewer and State Assemblyman Daniel O’Donnell, in addition to Manhattan Community Board 7, the Goddard Riverside SRO Law Project and Housing Conservation Coordinators, Inc.